I described the entire incident in my post Broken Leg: I don’t want to be in the Rocks. Now 12 weeks to the day after incident, I want to provide another update. The incident occurred at 12:15 pm on a Friday. I was with my close friend and frequent climbing partner Jim Davidson who was training for Everest (he is there now). Jim called 911 and cared for me for the next four hours as I lay in the rocks on the side of a mountain. Climbing Rangers from Rocky Mountain National Park arrived near sunset to begin my rescue. Search and Rescue teams from Larimer and Boulder County came in full force to assist. In all about 40 people helped save me that afternoon and evening. 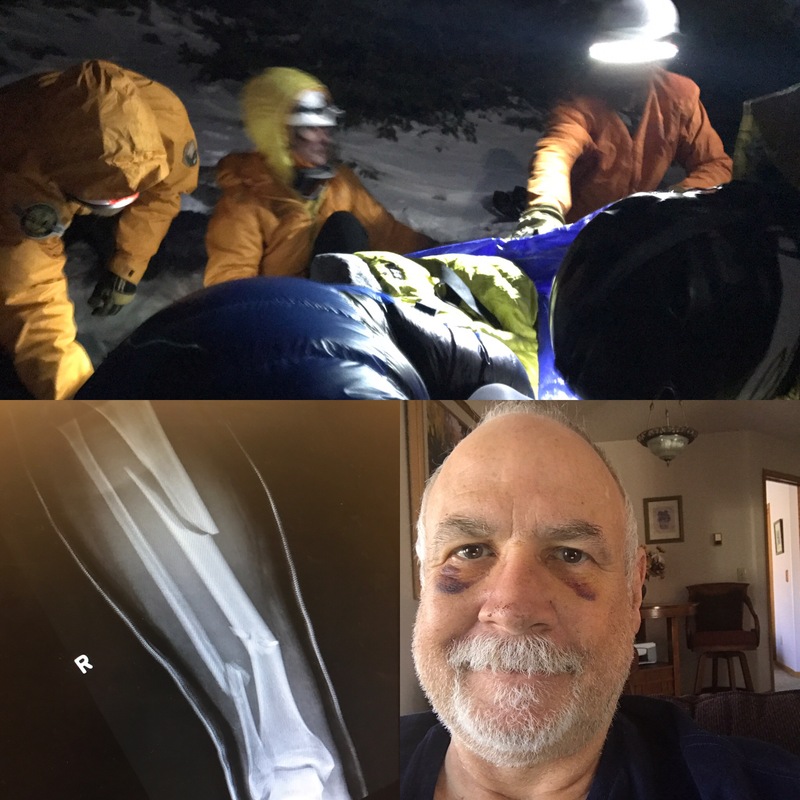 I was taken to the hospital in Estes Park but then transferred a few hours later to The Medical Center of the Rockies in Loveland, Colorado where Dr. Orr repaired my nose and Dr. Riley, my leg. Over the past three months, I have been diligent in my physical therapy. My orthopedic surgeon, Dr. Riley Hale, told me to push to my tolerance as I healed. By stressing the fracture it would heal faster and stronger than by laying around. I was clear with all my doctors and therapists that my goal at age 60 was not to be able to move from the couch to the chair. I wanted to climb again. 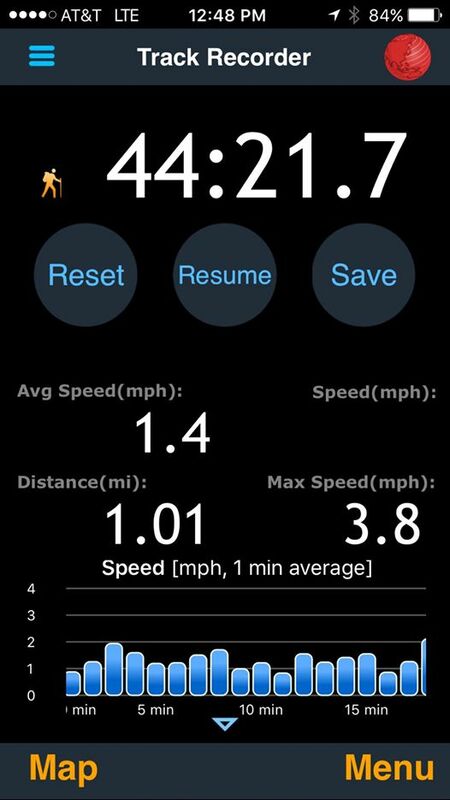 To start, I rode a stationary bike, walked as much as half a mile and did laps on three flights of stairs. I pushed myself very hard. 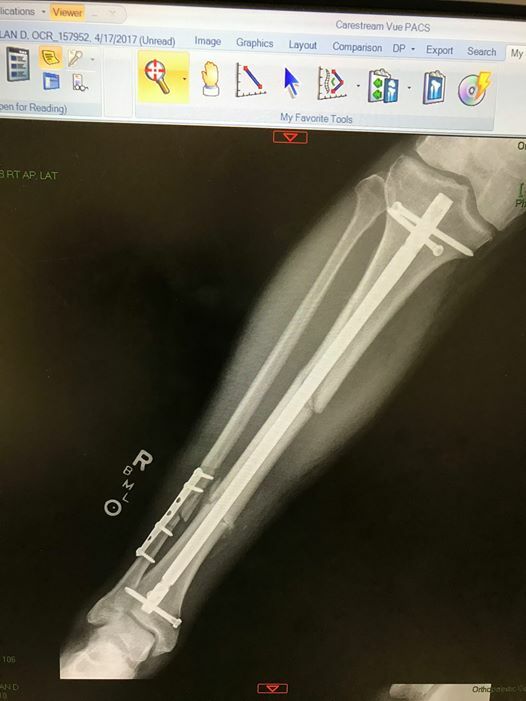 On Monday, April 17, I saw Dr. Hale, my Orthopedic surgeon for the 10 week x-ray and check. 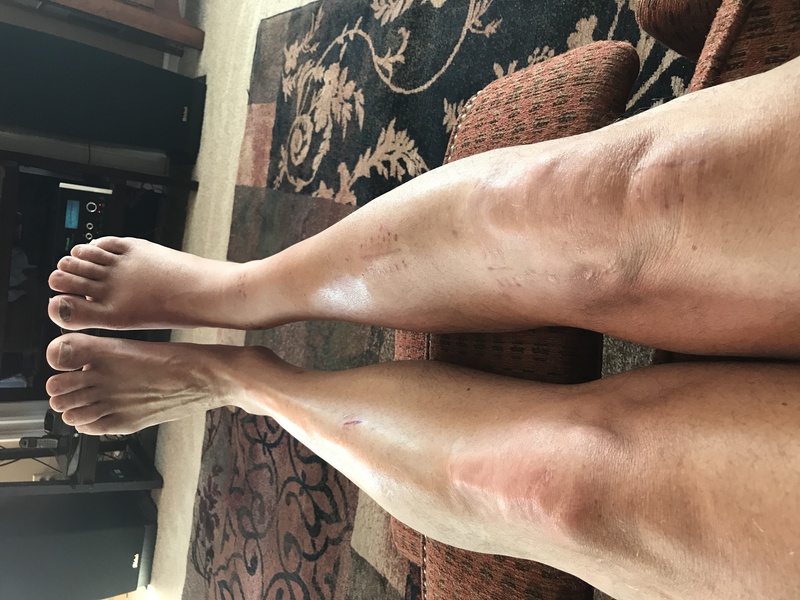 I was a bit apprehensive as I felt good but was experiencing an “awareness” (I refuse to use the word pain) in my lower shin area when I strongly stressed it. He said I was progressing faster than usual, and was pleased I was not using crutches. He was surprised that I was wearing street shoes. He said my swelling was normal and my gait looked good and would improve. Then he paused and said something he had not previously mentioned. As I left Dr. Hale’s office with the great news, I was ecstatic. I immediately thought of taking my new freedom out for a spin, to return to RMNP, to climb a snow couloir since it the best time of year to do that. My mind was exploding with options. Then I started walking to the car. I stopped by the grocery store on the way home. Each step reminded me that I was still healing. I was no longer hurt, but I was hurting. The tissue around my damaged bones needed to heal. Even though the fracture was starting to heal it was not 100%. The tendons, muscles and surrounding tissues from my knee to my toes reminded me of the extent of damage. They spoke loudly to me when I pushed too hard. It was difficult to accept, but I was not climbing anything soon. And, not but, I was grateful to just walk around the block. The memory of lying in the rocks was alive. It was living, breathing and occasionally reaching out making sure I never forgot. Lying in those rocks, an hour after the “incident”, I told myself, I was not going to be a victim, I was not going to be defined by this event and I was going to find the positive. I made some firm decisions almost immediately. I made choices about how I was going to respond to this incident. I selected my vocabulary carefully, not out of denial or being pollyannish but to set a positive tone for me. I use the word “awareness” instead of pain. If someone asks me if it hurts, I say I have a high awareness of the area. I refuse to say this was an accident, it was an “incident“. What happened, was out of my control. The only way to have avoided it was to not do what I love. And I refuse to compromise my life on the random chance that something may happen. I believe in the mind-body connection. When I take a step, I visualize the second step, not the first. The first step always challenges me. I can be wobbly, uncertain. I can be a bit timid so I forget about the first and move on to the second which is always easier. Speaking of visualizing, I close my eyes often. I visualize taking a slow, simple step at 8000 meters, front pointing into steep vertical ice, standing on a summit – 9,000 feet or 29,000 feet. I know I can do this. I simply do not entertain any alternative. But to be clear, I can’t walk walk far, I can’t run, I struggle over uneven terrain. I am not ready to do what I once did. And that is my reality I accept. What I can do is stand one leg, I can walk to the mailbox. I can wear street shoes. I walk one mile outdoors once a week now. And that is a victory. When I stand up, at times I feel like an Olympic gymnast at the end of a pommel horse dismount – bent over, arms wide, rising slowly careful not to fall. 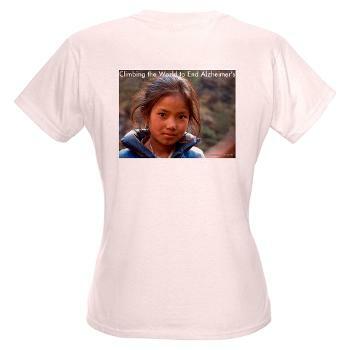 I accept my progress in short, simple, meaningful moments, just like I do when climbing an 8000 meter mountain. If I push too hard, too fast or too far my body lets me know if I am not ready. A phrase recently came into my head, if it is not going smoothly, you are doing it wrong or are not ready. So I push hard, push like Hell. 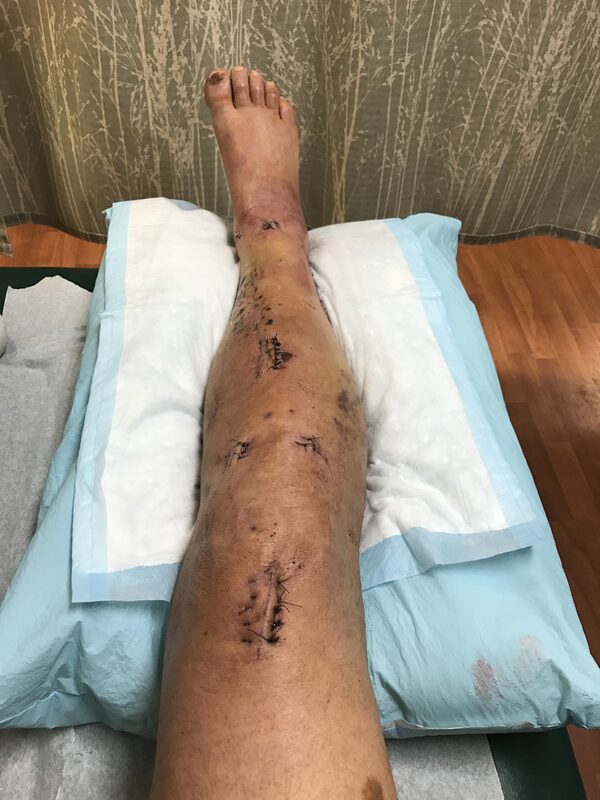 Dr. Hale told me at week 4 to push to the limits of my tolerance to make sure the bones heal solid, the bones heal strong – and that is what I am doing. Strong and solid – that is what will get me there. And I dream about the next mountain even though the one I’m on is pretty challenging. Someone asked me if climbing Everest or K2 was more difficult than this incident. This was an event, those climbs were a journey. The call of climbing is strong and seductive. 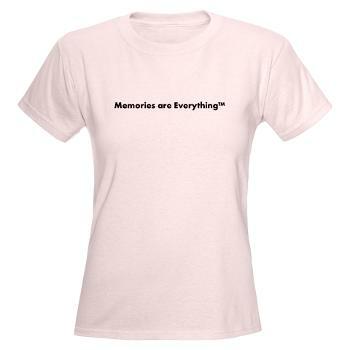 It causes memories to be short, desires become insatiable needs. The struggle to survive is an addictive drug that seems to cloud good judgment and takes you on another journey in search of unrealized gratification. And the satisfaction is real. The sense of accomplishment is deep and pride that you set a hard goal and met it, is genuine. As I drove home from the doctor and store, I put my “awareness” aside and began to mentally draft a letter to potential sponsors. 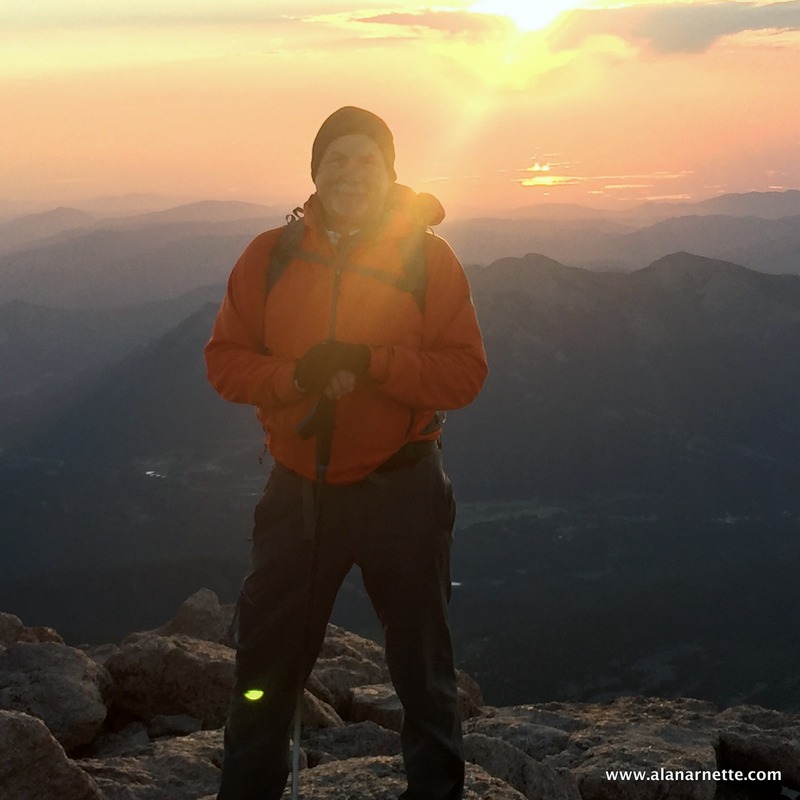 I was anxious to return to “climbing the world to end Alzheimer’s.” I wanted to resume my Project 8000 and climb another 8000 meter peak. I began to think thru the details of training and logistics for an Autumn 2017 8000er climb. My heart raced, my palms became sweaty. I was excited. I gingerly walked up the stairs and to my computer. As I sat in the chair, my leg stopped chattering. My hands dropped to my quads. My right one was 30% smaller than the left. The atrophy was real. This would take time. During a PT session, my therapist asked me to step on a soft rubber cushion and push off with my right leg. I couldn’t. When she asked me to walk sideways, I lost my balance. When she said walk backwards, I drifted. Yes, this is hard, but not impossible. It will take time to be strong and solid – enough to reach a mountain summit. Will I climb again? Yes I will. Thanks for sharing your personal experience with your broken bones. I can relate very well, having shattered my femur. I have been pushing my recovery for 2.5 years, and still do not have my previous strength. I have been testing myself, as you did on 2 Sisters. I had to cancel my Mt. Robson date for this August; since winter back country skiing and summer ’16 mountaineering with ACC, told me I’m not where I was yet. ps you are healing quicker than I; but then I lost 4 bags of blood Nov 2015. Alan you will get there. But I know patience is tough when we are raring to go. You’ve got the right attitude and discipline. I got back to hiking and playing tennis after a shattered ankle – some “awareness” still but fully functional. It took about 7 months. Your positive attitude & perseverance will get you there. Wishing you continued improvement. Yes, you will climb again, but the word you need to remember is patience.